The Colonial City of Santo Domingo has high symbolic value as an early colonial settlement in the New World: it was founded in 1498. It boasts the Western Hemisphere's first cathedral, its first monastery, its first hospital, its first university, and its first court of law. 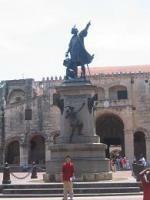 The historic enclave of Santo Domingo, known as the Colonial City, covers three sq km. Inside the walls are dozens of historical buildings and sites, including palaces, forts, museums, and churches. Santo Domingo's place in history assured by being the oldest European town in the New World, founded in 1498 by Bartolomeo Colón, brother of Christopher Columbus. It was built according to the classic Spanish town plan (a central Plaza de Armas and streets crossing in right angles) that became a model for almost all cities in Latin America, and is home to the oldest cathedral, castle, monastery, fortress, university (and many other firsts) in the New World. Its position as the capital for all the Spanish domains did not last very long, as Havana was soon found to have a more favorable position, but the city did manage to preserve the remains from its glory days quite well. The star attraction is the well-preserved Cathedral of Santa Maria la Menor, known as the Catedral Primada de America, the seat of the first Catholic diocese in the New World. It combines the expected Baroque ornamentation with Gothic features quite unusual on that side of the Atlantic. Next to the cathedral is the Parque Colón, a classic Spanish town square with a statue of Columbus, and just steps away is Calle las Damas, the oldest paved street in the New World. The Colonial Zone is not very big, and can easily be explored on foot; other buildings that I found interesting were the Alcázar de Colón (the former governor's mansion built for Christopher's son Diego, first Viceroy of the Indies, today a really well done museum), the Museo de las Cases Reales (the later residence of the colonial administration, also very interesting, but quite similar to the Alcázar), the Fortaleza Ozama (the oldest fortress still standing in the Americas), and the Plaza de España, a wide square where the WH inscription can be found. There are also various other historic buildings scattered throughout the Old Town, including the former residence of Hernán Cortés, conqueror of Peru, today the seat of the French Embassy, and the ruins of San Nicolás de Bari, the oldest hospital in the New World. It is clear that the Dominican Republic has invested quite a bit of money into the Colonial Zone to lure tourists away from the beaches, and for anyone interested in history, this is a great site to visit. 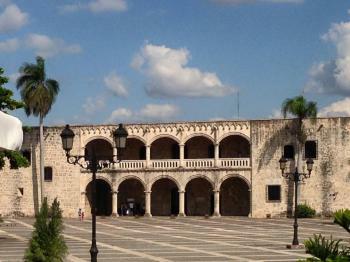 The Colonial Area of Santo Domingo is small, pedestrian and worth a couple of hours and then lunch. It's somewhat lacklustre despite its historical significance. Havana is much more impressive. Santo Domingo is a beautiful place. I went there on a day trip from Puerto Plata. The cathedral is pretty breaktaking and it's considered to be the first cathedral in the new world. While in Santo Domingo, I also visited El Alcázar de Colòn, which is an old restored house that belonged to Diego Columbus. I did not have time to visit the lighthouse where Christopher Columbus is buried however. Overall, Santo Domingo was well worth spending a day away from the beach. 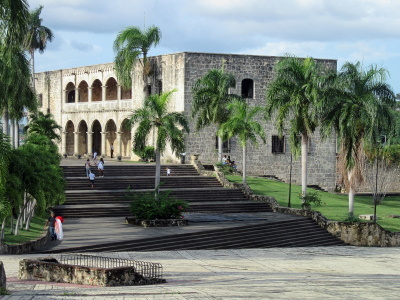 Universities: Santo Domingo became the site of the first cathedral, hospital, customs house and university in the Americas. Part of Cultural nomination rejected: Was originally nominated to include the archaeological sites of La Isabela and Concepcion de la Vega. La Isabela is around 200kms from Sto Domingo and is regarded as the first formal European settlement in the new world (1493 by Columbus). La Vega is around 125kms from Sto Domingo and grew from a fort built by Columbus in 1494. Whilst recognising the "evident symbolic value" of properties "so closely linked to 3 significant moments in the history of Hispaniola in the period following the discovery of the island by Christopher Columbus" ICOMOS/UNESCO was (back in 1989) "disconcerted" to "find a single proposal for 3 properties so distant from one another"! As of 2009 both rejected properties are individually listed on Dominican Republic's T List.